Sleep, which is a basic need and natural part body process, has become a luxury nowadays. Though most of us would give anything for a few more minutes of shut eye, somehow life has made it impossible to do so. With the increasing demands of life these days, more and more people are having trouble with sleep. Aside from the fact that the hectic everyday schedule of most individuals is making us sleep late and wake up early just to catch up on things, we also don’t get the most out of the little time we manage to hit the sack. Wonder why when it seems easy to nod off when we’re tired? Well, a lot of things from poor sleeping environment, back problem, to sleeping disorders, distractions, and even eating too close to bedtime or drinking coffee affect our body’s ability to get a deep sleep. The thing is, in order to be at your best in everything a good night sleep is necessary. Despite all of that, we all should know that sleep is a necessary part of our lives that we shouldn’t take for granted because otherwise, it will affect our health. Getting an adequate amount of sleep doesn’t just mean waking up refreshed and alert, it also means lower blood sugar, recharged organs, allowing tissue growth and repair, increased blood supply in the muscles, and recovery from exercise. 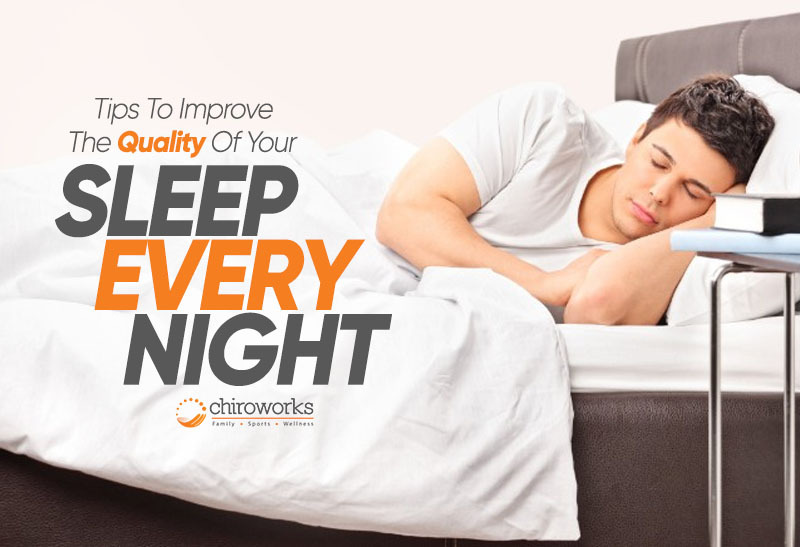 In this case, regular chiropractic care can help increase the quality of sleep for many people. By simply putting our body back in proper alignment it will restore the function of the body systems and help wind down and relax our body which leads to more and better sleep. Now that we know the importance of sleep when it comes to our overall health, can you imagine what would happen if we don’t get enough of it? You wouldn’t expect some of them but would definitely make you exert more effort for your sleeping time. We can all use work, family, and life as an excuse on why we slack on sleep, but if you are determined to juggle all of those, understand that you need to sleep better in order to do so. Trying to compensate for the lost sleep during the weekend doesn’t even cut it. Here are more ways to improve the quality of your sleep every night. Do you often find yourself having a hard time falling asleep? That’s because you rely on feeling sleepy instead of making your body recognize that it’s time to sleep. You can do that by creating a sleep ritual. This means preparing not just your body but your brain to sleep so that you don’t toss and turn all night. The first thing is to sleep at the same time every day before the allotted sleeping time make sure you don’t eat anything heavy or drink anything caffeinated. Block out light from outside your window, set your bedroom temperature to a maximum of 69 degrees F and don’t watch TV or browse through your phone. It also helps if you invest in a good mattress, sheets and pillows to create optimal sleeping environment. Lack of sleep isn’t something to be overlooked. It’s important for everyone to get sleep and wake up well rested because when you do, you feel better, look better, and work better. However, the problem is that more and more people are having a hard time get proper shut eye which not only lead to poor performance but as well as health issues like diabetes, high blood pressure, memory problems, weight gain, headaches, impotence and an impaired immune system. Good thing some people have started to discover chiropractic care. They’ve found how it greatly helps them with their sleep troubles. Chiropractic adjustment relaxes your body, corrects misalignments that disturb body and brain communication causing unbalance in your body and affects sleep, helps relieve pain and teaches proper sleeping position. All of these can help you achieve quality sleep better than any sleeping pills out there. If you’re now thinking about chiropractic care, there are a lot of chiropractor in Singapore that can help you understand how it works and how it can help you specifically. If you can’t quit coffee altogether, you should at least avoid drinking a cup when you’re about to hit the sack. This is gonna be hard for coffee lovers out there but caffeine found in coffee is a stimulant. This is why you feel a boost in energy whenever you drink coffee. However, despite its great help especially during those afternoon slumps, it’s not good to let you love for coffee keep you from having a good night sleep. You should at least try to stay away from coffee within four to six hours of bedtime. Adding exercise to your daily regimen helps with all kinds of things that may interfere with your sleep, like anxiety and depression, but it also provides specific physiological boosts to sleep itself. Exercise strengthens circadian rhythms, and may stimulate longer periods of slow-wave sleep, the deepest and most restorative phase of sleep. Polls have found that people who exercise regularly, even if they don’t get any more sleep than non-exercisers, report a better quality of sleep. It doesn’t matter if you choose pocket sprung, memory foam, ergonomic latex pillow as long as it suits and supports your size and weight. Aside from that, your sleeping space should be comfortable from the mattress, to the pillows, down to lighting and even the temperature. Your mattress isn’t the only one that can make a difference in your sleep. Your pillow plays a big role too especially when it comes to how you like to sleep. · This position needs two pillows with soft top pillow over a firm one if you have neck pain. · For lower back or hip pain sufferers, a pillow between your knees or a thin one under your waist is advised. · People with shoulder pain who sleep in this position should lie on their good side, and then put a pillow in front to support the bad side. It also prolongs the healing process of the bad shoulder if you sleep with one arm above your head. · The pillows shouldn’t bend the head and neck forward to ease neck pain. · Individuals with back or hip pain need a pillow under their knees, or a thin one in the small of their back. · This position calls for a small flat pillow lengthways under the affected arm and shoulder if you suffer from shoulder pain. · This position is not recommended at all since it strains the neck and upper back. · Sleeping with one knee bent up with a flat pillow under your head and neck can help if you have neck pain. · Lower back or hip pain sufferers find this position comfortable sometimes, but it’s not good for you in the long run. · Lessen the strain on the lower back by putting a flat pillow under your stomach.